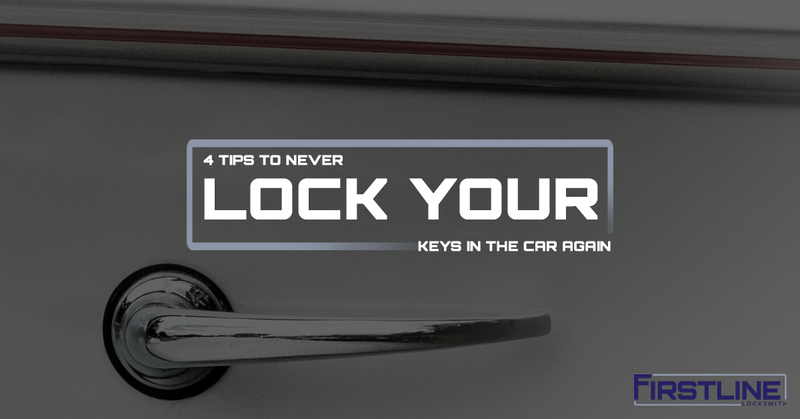 4 Tips To Never Lock Your Keys In The Car Again! With all the smart technology we have at our disposal, we still seem to accidentally lock our car keys or fob in the car. In some cases, we’re in a hurry and forget to grab the keys out of the cup holder. Sometimes we forget we’ve left our key fob in a gym bag or our purse, which we leave on the front seat for a quick run into the coffee shop. When we return, we can’t get back into our car. Other times, the kids or pet hit the lock button while filling up the tank with gas. Your first reaction in any of these situations may be to try and gain entry by force, using a wedge and a metal rod on your driver’s side door, but Firstline Locksmith recommends you refrain from breaking into your own car. It’s better to give an experienced local locksmith a call to help you regain entry so you don’t damage anything. In this post, we’ll share four tips on how to never lock your keys in your car again and why an “exit” routine with your vehicle can save you time and money. A routine upon exiting your vehicle can save you time and money. Create a process by which you follow every time you exit, lock, and leave your vehicle. For example, you could park your car, turn it off, pocket the keys, exit the vehicle, gather your belongings, and then lock it. A simple pattern helps immensely. Those prone to locking their keys in the car frequently don’t have a set routine they follow, which increases the probability they’ll lock up without their car keys in their hand. When we go places, we tend to take our wallet, purse, gym bag, or children. This means our focus may not be on our car keys or car fob when exiting the vehicle. If you attach your keys or fob to a lanyard, you can hang your keys or fob from your neck immediately following car shut down. This ensures you’ll never lock our keys in the car again, since you’re always with your keys. Similar to the lanyard, a carabiner allows for you to attach your keys to your person, whether to your belt, pant loop, or purse. Clip your keys to something you can’t forget when leaving your vehicle, and you’ll find that the moments when you lock the car, close the door, and feel a rush of anxiety that you just locked your keys in the car again will disappear. In most cases, people remember their wallet or purse before they remember their keys. Our ability to pay for things or identify ourselves are stored in these accessory items. When you make a copy of your car key and place it in a purse or wallet, you increase your chance of not locking you key in the car. If you happen to lock your keys in your car, don’t go searching online for “locksmith near me.” Call Firstline Locksmith. We’ve been serving Trenton and the greater New Jersey area for more than 25 years.